The next best thing to holiday baking—finding someone who will do it for you. Here are 11 appetizing gifts perfect for your Martha Stewart-loving BFF, your culinarily gifted little bro, or just that coworker you’d like to encourage to bring in some treats. Help your favorite chef expand beyond fettuccine. Stocked with pre-measured flour, porcini mushrooms, and truffle-infused olive oil—and a ravioli recipe, obviously—this box transforms every cook into a culinary artist. Mangia! Inspire a little gift giving of your own when you treat the baker in your life to a set of triple chocolate cookie mix, tags, and twine. (The sparkling brut wine is theirs to keep.) And take comfort in knowing your present isn’t purely self-serving: Each purchase provides 25 meals to a child in need. This handy Scandinavian device lets cooks whip up egg-based delicacies in 10 minutes or less. The easy-to-follow process: butter the handheld porcelain cup, add in tasty ingredients, boil, and enjoy! Ensure Mom never forgets Great Grandma’s sugar cookie recipe with this thoughtful gift. You simply upload the image and the company engraves the recipe—in the original handwriting!—on a 1.7-pound bamboo slab. Find It: Kustom Products Inc.
Christmas cookies get a sweet upgrade with this six-piece kit. Budding bakers can dress up classic shortbread with the vanilla lavender salt or amp up their must-try truffles with a sprinkle of espresso salt. Prove that everything really is better with bacon. The pork lovers in your inner circle can pig out on this mix of boozy bacon barbecue sauce, maple bacon aioli, and maple bacon onion jam. Take the guesswork out of cooking (and searing, simmering, and poaching). A wireless sensor ensures the temperature on this 12-inch portable stove never wavers, while the app allows users to watch over their perfect steak from across the room or house. 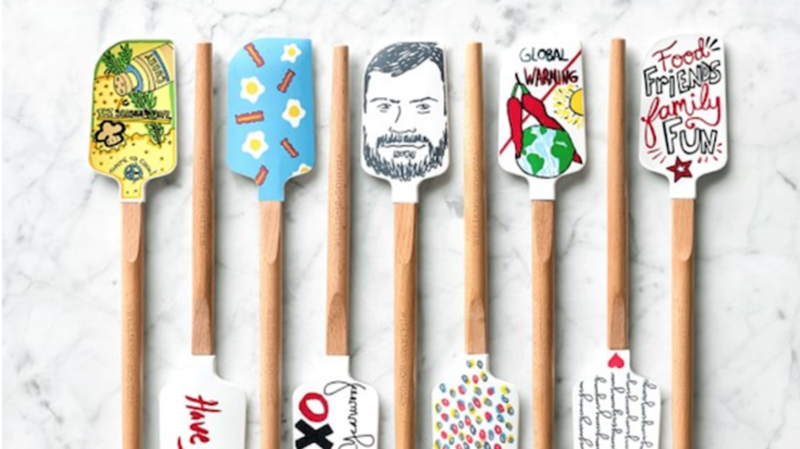 These spatulas spread more than just cake batter. Thirty percent of proceeds from each tool—designed by the likes of Chrissy Teigen, Jimmy Kimmel, Ayesha Curry, and Trisha Yearwood—benefit childhood hunger charity No Kid Hungry. Brighten up a basic kitchen with this colorful stainless steel set. Along with the standard tools (think: a chef’s knife), the affordable kit includes a peeler, a cheese knife, and a pizza slicer—helpfully labeled “pizza”—all coated in a non-stick finish for easy cleaning. Give them the whole world or, really, just their corner of the United States. Each piece of dishwasher- and over-safe porcelain tableware is designed to resemble a region of the country. Gift them a dish representing their home turf or snap up all five!